Owing to her avant-garde presentation of Tagore’s mellifluous numbers and her more interpretative work on the genre while retaining her earthy Santiniketan roots, Sahana Bajpaie is today known globally among the youth and to the more learned ears as a harbinger of spectacular possibilities. Sahana, awarded at the UK Parliament ‘The Bengal's Pride Award’ 2018 for her contribution to Arts and Culture, has long delved into the foray of playback singing too, with famous directorial ventures like Srijit Mukherji’s ‘Ek Je Chilo Raja’ & Parambrata Chatterjee’s various films. Also, having performed at famous venues like the Royal Albert Hall, the Grassi Museum Leipzig, Germany, Sosnowiec Music School, Poland, the River Festival, Padova, Italy, her mastery in live performances, speaks volumes, of her inner musicality. Her fellow bandmate, Samantak Sinha who studied Sound Engineering and Music production in London as a Charles Wallace Art scholar, is a singer-songwriter and music producer from Kolkata, specialising in original songs, Rabindrasangeet and modern Bengali songs. 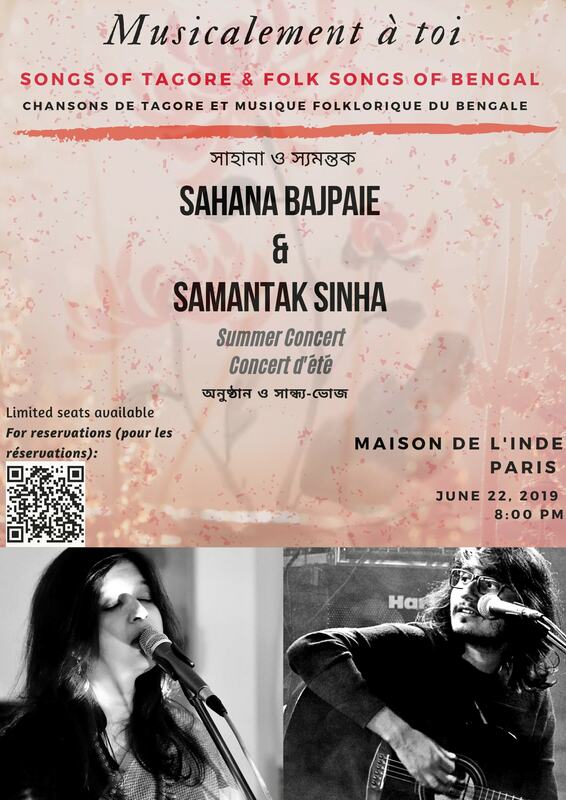 Sahana & Samantak come to Paris for the first time, to bedazzle you with their intimate and powerful renderings of Tagore's music and the lilting melodies of the folk music of Bengal. Come, join us, for an unforgettable soiree!